Would love the Halloween day one if you can get it! Can you put me down for Mary Poppins Returns pin set. Thank you. Thank you. Thank you! Can you put me down for: Donut Shop: Pluto and Lattes with Character: Ariel. 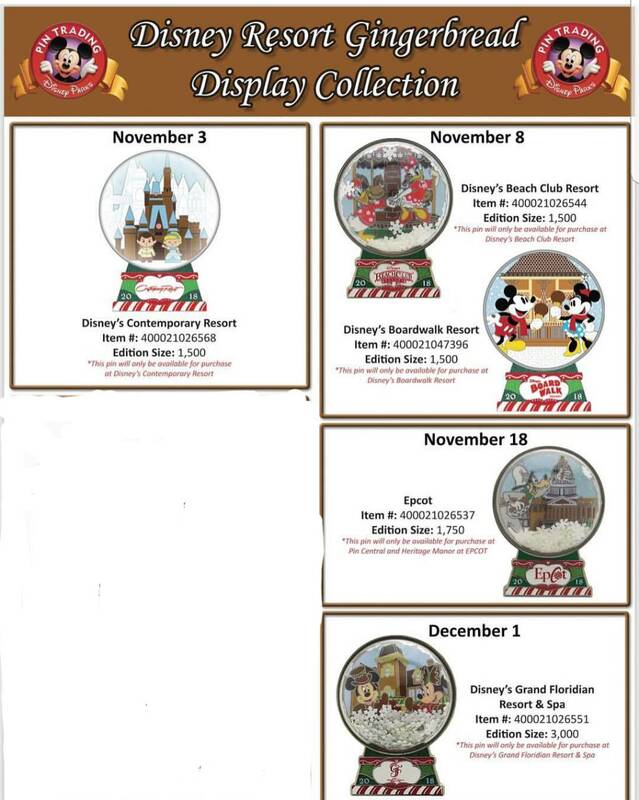 Also, I will be in WDW from Nov 18 to the 25th (MVMCP on the 25th). I know that's a super busy week in the parks, but I could pickup my pins in person. Also, if you dont think the Pluto Donut pin will sell out I can get that myself. Let me know. Thanks!!! Shelterkat, Jack Skellington and stitchismyspiritanimal like this. I'm afraid I won't be in the parks at all during that week. also, I would be SEVERELY shocked if Pluto sold out by then. Sorry I wont be able to see you! but I know the parks are just nuts that week (but it's the only week the whole family can go). Can you just put me down for Lattes with Character: Ariel. I'll get the donut pin when I'm in the parks. Hi could I get the Halloween Day 2018: Lock, Shock, and Barrel? Would you please remove me from the Snowmen set? I would like a Frozen anniversary pin if you’re still taking names. Thank you! Updated to this point! And I've added the gingerbread houses! Invoices for this month will begin next week. The Cindy and Donald/Daisy gingerbread Pins, please and thank you. I'm not totally sure how many I'll be able to pick up tomorrow, so I'm going to wait to see how it goes. If I manage to snag it, I'll post here and send out an invoice for it in the next day or so. I know the list is long but can you please put me down for the Frozen 5th Anniversary (Olaf Slider) too. One. Also if I get any of the pins I tried for I will have them all shipped to a Florida address so no international shipping. Okay! Update from today, I got all the Halloween pins except for 1. So @QWERTYPie I will grab yours next round. The Wreck it Ralph single OEs have all been picked up! As for the mystery boxes, they have indeed dropped. But apparently they sold out in a few hours this morning. After going to three parks, I managed to get two (for myself) because someone happened to return them not long before I came by. But they are limited release and I have been assured they will be back very soon. I'm kinda thinking there will be some at the pin event on the 8th. So stay tuned. Invoices for the new Halloween requests will go out tomorrow or Friday. Wolfcryrain and Jack Skellington like this. Put me down for the MVMCP Snowmen boxed set, please. May I please request both of the Mickey 90th birthday pins please. Pin Trading Station by Starbucks sold out of the mystery boxes, but Mission Space, Mexico (Plaza de Amigos), Italy (La Botegga Italiana), American Adventure (Heritage Manor gifts), UK (Crown and Crest) pavilions had them today!